Theater. Community gathering spot. Provisions and notions. Carnival. These are all words that might be used to describe the Central New York Regional Market. To this list I'd also add complicated. I ventured out in the rain this morning to find the organic farmers at the Market. My hopes were that I'd meet some of the folks I have been talking to and hearing about--like Darren of Salvere Farm and to gather some tips to offer for shopping the market. I began with Wendy Gornick to pick up some chicken and short ribs. And then I began hunting for vegetables--the organic vegetable growers, that is. What they say is true--once you find one, you can quickly find the others. But at every stand as I spoke with the farmers about what it is like to work the Market, I heard a shopper come up and say some variation on: "Oh here you are! Why do they keep moving you? I really wish you were in the same place every week." At these same stands I also heard variations on: "These are the most beautiful squash I've ever seen! That basil smells incredible! I've got to have some of those cherry tomoatoes!" 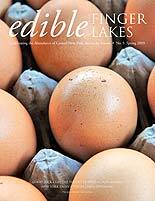 There is a dedicated group of consumers in the Syracuse area hungry for fresh, local, organic food. 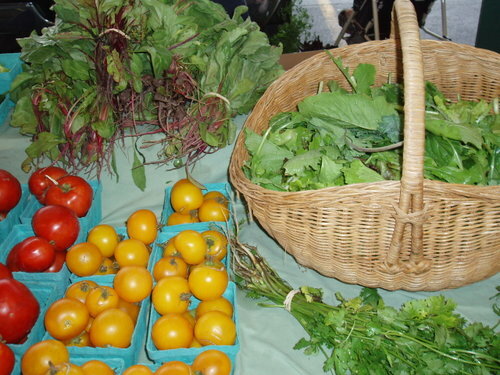 There are dedicated farmers selling organically who want to sell their goods. Farmer and consumer alike are frustrated by the moving around of the small organic farmers. Some of the vendors at the market have been there for 70 years in the same spot. 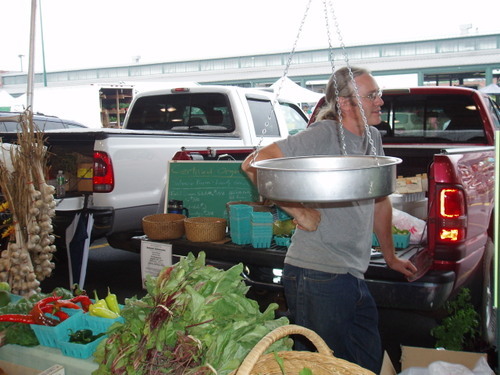 Permanent leases are usually given to those who are at the market all year long. When spots open up, they are almost "sold"--meaning, passed down-- like real estate to the farmer's kids or a vendor the farmer knows. In other words, getting a permanent spot is really difficult. Sure, there are ways to make it easier to find the organic folks but the Market Authority hasn't seen this as a priority. Many of the farmers find the CNY market to be a losing proposition--competing with wholesalers with lesser quality produce means the organic folks often price their food at lower amounts than it might otherwise fetch. Many farmers at the Regional Market do not have signs or they are small and hard to notice so you may have to ask alot just to find out the name of the farm you are looking at. There is a lot of interest in creating an organic farmers market in the Westcott or University Hill area of Syracuse. The situation at the market for organic farmers and consumers is much better than it was 10 years ago. So how to shop the CNY Regional Market? Here are a few tips with photos of the farmers so you know who you are looking for. At the bottom of the post I'm excerpting some comments posted by Kathy Barry about here Saturday morning shopping ritual that makes use of the wonderful shops Syracuse has to offer--including the Regional Market. Finally--be sure to check the comments section on the last CNY Market post--there is a lot of good stuff there. Wendy Gornick and her organic chickens, grass fed meats, honey, and eggs is located in A Shed. 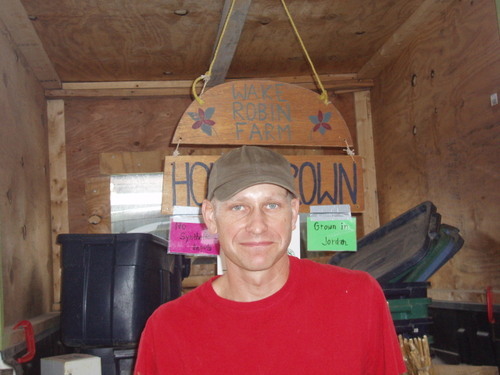 Wake Robin Farm, Sacred Seed and Salvare Farm--all local, organic (certified and not) farms can be often be found in C Shed. Often, Sacred Seed and Salvare are adjacent to one another or across the aisle from one another. According to Bruce at Wake Robin Farm this will probably be their last year selling produce. They are planning to come back with great dairy products including milk, butter and cheese. Stones Throw, Sacred seed, Wake Robin, Salveres, plus Ron and Lillian, the garlic growers all fill our baskets each week.Some beatiful, flowers from Susan at Pods and Poppies completes our organic bounty. As well as a bottle of organic wine from John Sustare at pheasant ridge. In between I might buy an occasional non organic item. But I always buy from the small farmers, those who are actually growing the food. Its actually quite easy to spot the resale vendors. Those are the folks coming to market at 4am, buying produce and reselling it. The dole bananas, the strawberries etc. 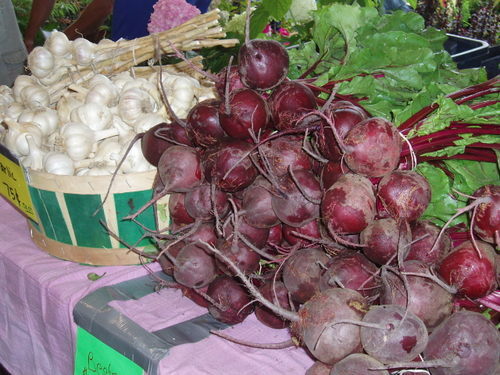 Just knowing whats in season can help in identifying whose produce is local. Here's the part of the adventure you don't get fom the Ithaca market. Returning to our home in the university we wind throught the North Side, stopping by Lombardis,where they always know the kind of cheeses we like and offer new ones to sample.Fresh pasta for the pesto I'll be making,as well as some carnoroli rice for risotto are the main reasons for this stop. Hopping over to Pascals for coffee and a scone, we continue on to Samirs for olive oil, bulgarian feta, and lavosh. Here Gabi has been known to offer a cup of his special coffee, as he questions whether or not I really want a certain type of oil, too strong for you. Generally he is impressed that we want the good tasting stuff. We love this Saturday morning trip, we make plans for the week as we drive around, listen to the great music, and turn an errand into a pleasant hour or two. We don't stop every place everyweek, but always the Market and the Co-op. Great post! It will be good to get back up there and do some real exploring. I'm going to be living less than a mile from Lombardi's... wee! cheese! My parents used to live near there and my mom still uses the pasta dish she bought (and they still have them all up at the front). I checked out the market again yesterday for my second time but this time armed with recommended vendors. I was able to find the three discussed above and came away with some very lovely produce. It felt like a much better experience because I was sure this time that the food I purchased was local and did not leave questioning what I got. Next time I will have to check out Wendy Gornick's place as well, that sounds like great stuff. Thank you for all the information, it was a great help! Thanks for the mention Jennifer. And for looking at the market and thinking about how to address certain issues. I am a market supporter- it is easier to go to Ithaca but with a number of organic farmers working hard to be here, we made a house descion to support them. Get over to Stones throw Farm nextime. Last shed, end toward train station. They also do Toad hollow compost. Amazing tomtatoes, chiogga beets, yellow carrots,and other delights. Thanks to all for the tips and suggestions. I'm a newbie to Syracuse. I went to the Saturday CNY market again last week (the rainy Saturday) and on Tuesday went to the Downtown Market. I found the Downtown Syracuse Market much more do-able (less vendors/less crowd-chaos). I wish I could remember her name, but there was one great organic vendor there. I bought corn from her, beans, tomatoes and squash. I will continue to explore all that Syracuse has to offer. I don't mind hitting the CNY Market for just a few local, organic folks as long as I can find them. My biggest problem is the crowds. It's really too insane with all the baby strollers and people there just for the "food court" vendors. One thing I didn't see mentioned by anyone else. The Martin's Pretzel stand is excellent. Their $3.50 bags of broken pretzels are one of the great finds at the market. They may not be local or organic, but the pretzels are made I believe in Pa. and from all natural ingredients. And they are delicious. Oh, and I LOVE the Syracuse Food Co-op. What a gem in this town! I'm planning a Labor Day weekend trip to Ithaca to check out their market. I was happy to have found that suggestion here! Thanks again for this great blog. I look forward to more posts! Thanks everyone for the positive feedback. I'll definitely check out Stones Throw Farm--their Toad Hollow compost is all over my garden. If any of you ever have recommendations of places to check out at the Regional Market or elsewhere in the area--do pass along! Hey Jennifer...Loving the Blog. Been lurking on and off for years. Great content. Fun Links. Great pics. Thanks to everyone that comes out to the market. Thanks to Jennifer for spreading the good word. We recognize its an intentional choice to shop locally in this day and age and we greatly appreciate you all making that choice. As Kathy and Brian's morning ritual attests to it can be not only DELICIOUS but a lot of fun! Thanks for posting a comment. Now that I know where you are located (in the last shed closest to the train station) I'll be sure to visit--camera and basket in hand!